Replacement dust bags for Nilco Combis and 276. 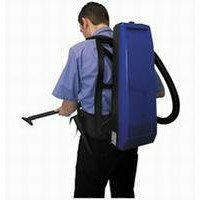 The Nilco RS17 Back Pack Vac is specifically designed for the effective vacuum cleaning of confined, difficult to reach or small spaces. The RS17 has a highly efficient dust micro filter, effective at 0.3 microns. This means that even the smallest of dust particles are kept inside the canister ensuring a cleaner environment. The Nilco RS17 Back Pack Vac has an ergonomically designed harness that conforms to the shape of the body giving the operator maximum possible comfort. Extended periods of operation are further enhanced because of the machines light weight. It has a long 2.4 metre hose reach and useful on-board tool storage. Motor overload protection is built into the machine as standard. Emptying is less of a chore due to a large 6 litre paperbag capacity meaning less frequent changing of bags.